I am a sea-going observationalist in the field of physical oceanography. 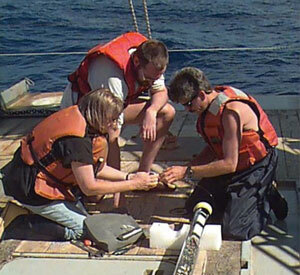 I conduct and direct field programs concerning ocean circulation and climate, with a focus on the South Atlantic. My specific interest has been using observations to quantify and understand the dynamics of heat and mass exchange. Oceanography was not my first choice of study. I grew up in Buenos Aires, Argentina, and my first degree was in physics from the university of Buenos Aires. After that I obtained a doctorate in physics from a joint program between the La Plata and Maryland universities, and the subject of my dissertation was a model of the galactic structure. The first years of my scientific career were in the field of radioastronomy. I loved the subject, but at the same time I was interested in doing research in subjects more directly relevant to society. I started to interact with physical oceanographers and meteorologists. This is how, when I arrived in Paris in the mid 1970s, I was fortunate to obtain a position at the Laboratoire d’Oceanographye Phisique with Professor Henry Lacombe, who was my mentor. In 1980, we left Europe for the United States looking for a In 1980, we left Europe for the United States looking for a place where both my husband (also a physicist), myself and our six-year-old daughter could work and live in the same city. For 18 years I worked at the Lamont Doherty Earth Observatory of Columbia University where I attained the level of Senior Scientist. I thoroughly enjoyed the academic life. Yet it was a struggle to balance my life as a mother, a woman, and a scientist. At no time was this an easy task, and certainly not back then. I always tell young women scientists that the number one element to succeed in achieving a balance in life is to choose as the father of your children a supporting partner, someone who respects and supports your career. I have been fortunate to have that. Life at LDEO, as the only woman scientist was difficult, and I experienced several instances of blunt discrimination affecting my advancement and salary. This was in spite of my consistent ability to raise funds for my research and support staff. Another challenge was that most of the time captains of the research vessels had difficulties in accepting a woman as the Chief Scientist. Fortunately, not everyone was like that. Some of my colleagues were excellent men whose friendship and support I value to this day. And there were always the other “isolated women” miles away from Lamont with whom we shared experiences when at national or international meetings. When women started to fill up the laboratories as graduate students and young scientists it was a pleasure to see how the working conditions had evolved positively for them, and to realize that I was able to play a role in making those changes happen. Accepting my current position as Director of Physical Oceanography at NOAA/AOML was the ultimate stage in both working on applied science and supporting the role of women in science. I take great pleasure in being a mentor, a guide, a supporter, and a friend to the young women in my division and in the field.